-Shock Waves: Am ability to fire shock waves that can paralyze enemies for 1-10 rounds. Silver the Hedgehog is a hedgehog from a post-apocalyptic alternate future in the year 3437, two hundred years away from the Mobius Prime's timeline. Silver appeared for the first time in Mobius Prime over Never Lake in Mercia, to the surprised Rob O' the Hedge and his wife Mari-An. Silver first believed Rob to be Sonic due to their similar appearance, but when Rob explained he wasn't him, Silver responded, telling him that he needed to find Sonic as "your future depends on it". Rob O' the Hedge explained to Silver they could find Sonic at Freedom HQ. Using Silver's super Warp Ring, the two traveled there together. Silver and Rob arrived together to find Sally and Alicia arguing about stranding Sonic and Amy Rose in Moebius. Sally explained to them what had happened, and thus Silver transported himself to Moebius with Rob. Once there, the two hedgehogs met up with Sonic, Scourge, Amy, Rosy the Rascal, Metal Sonic and Shadow the Hedgehog. During the ensuing fight, Silver attempted to discover which one was Sonic, first by asking everyone. 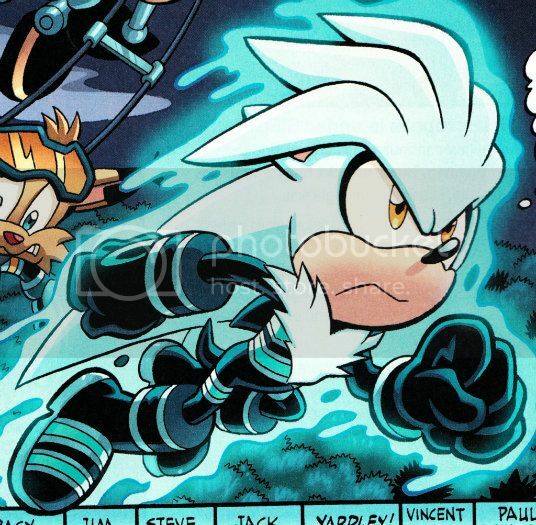 After being ignored, Silver captured everyone with his psychic powers and stated he has come to destroy Sonic, since in his future someone betrayed the Freedom Fighters and only Sonic was likely enough to have the power to do that. But Rob convinced him otherwise, saying that Sonic's heroism made it more likely that he wouldn't. Scourge then jumped in and attacked both of them, claiming that Silver should use his powers to give himself "a less-stupid haircut". Shortly afterward, Sonic made a proposal to everyone to stop attacking each other and strictly finish off Scourge. In response, Scourge used the Anarchy Beryl in his throne to transform into Super Scourge. Silver tried to defeat Super Scourge but was temporarily knocked out like all the others. Shortly afterward when Super Scourge tried to defeat the Suppression Squad and Freedom Fighters after they came through the Star Posts from Mobius, Silver used his psychokinesis to grab and hold Scourge before he could injure the cowardly Miles, but Super Scourge managed to break free. Silver tried this again on Sally's orders so the others could pile on top of Super Scourge long enough for him to lose his super form, but Silver's power failed him yet again and Scourge threw the others off of him. Scourge was later defeated thanks to the quick thinking of Sonic, as the Anarchy Beryl drained Scourge of his strength when he powered down. Following this, Silver walked back with the others to Dr. Kintobor's tower and told Sonic that he would find the Freedom Fighter traitor and would be back before departing to his home time via Warp Ring. Silver kept his promise and found his way into the Mobius: X Years Later dimension, thirty years after his first encounter with Sonic. During the celebration for King Sonic and Queen Sally, the Dark Presence's leader, Lien-Da fired a missile at the royal family. Before the missile could destroy the king and queen along with their children, however, Silver arrived just in time and used his telekinesis to destroy the missile and save them all, telling King Sonic that he returned to attempt to save his future once again. He later explained to them at Castle Mobius that he believed that now was the time when his future would be plunged into chaos, and says that the Dark Presence are likely connected to it, and Sonic says that he should be searching for King Shadow's former right-hand woman Lien-Da. Silver briefly came to fear that Sally might be the traitor after learning that she ordered the Freedom Fighters to disband, but did little to pursue this conclusion. He was later gassed by Misty-Re, a sleeper agent for the Dark Presence who was posing as a maid inside the castle. After Sonic gassed the maid, he told Sally to take the unconscious Silver and their kids to a safe room in the castle. With Silver still out cold, Sally did her best to carry out her husband's instructions and managed to get the children and Silver into the Panic Room, the latter finally starting to come around. King Shadow then unleashed Tikhaos, (the result of Chaos and Tikal merging together during the Elemental War), while Silver was starting to come around. Once King Sonic then came to try and resuce his family from the ruins of Castle Mobius, Silver had nearly got back to full power and helped in the fight against Tikhaos, and also managed to save Belle and Jacques D'Coolette. After King Sonic failed to strike Tikhaos's brain to defeat it, his children, Sonia and Manik Acorn, successfully struck the brain and Silver managed to catch them before them plummeted back down to the ground. With the battle over and the time-line saved for now, Silver inquired as to whether King Sonic remembered a traitor within the Freedom Fighters, and he said that he didn't but his trip through time had altered his memories a bit. Silver then pulled out the yellow Time Stone, said "Chronos Control" and disappeared in a bright light. Returning to his own time, Silver went to Onyx Island, doing research in a library there with the permission of his acquaintance Edmund. Finding a record of the Freedom Fighters, he discovered that one of the original members was listed as "Boomer" Walrus, leading him to believe that Rotor Walrus had infiltrated the group and was impersonating Boomer. Silver briefly considered consulting his master, but decided to take action himself, confident enough in his abilities with the Time Stones to forego the use of his Super Warp Ring. The Hedgehog then found himself conflict, not wishing to kill an individual for a crime they hadn't even committed yet, but eventually convincing himself after looking around at the ruined civilization around him and remembering that the traitor was responsible for it. Traveling back in time, he attacked Rotor as the Walrus made his way to the Northern Tundra, easily overpowering his nanite battlesuit and accusing Rotor of being both impostor and traitor. Rotor later managed to persuade Silver to help him in his mission; once convinced that Boomer was only Rotor's early years nickname, Silver returned to his time and, after a brief dialogue with Guardian Edmund, he reported his mission to his master, a slightly aged Mammoth Mogul.